Executives who explore and execute on their organization’s strategic frontiers can capture the future from their competition. BlackRock CEO Laurence D. Fink has a message for chief executives around the world: Resist the short-termist phenomenon plaguing corporate behavior. Forget the pressures for immediate returns and look to the future. But his message is not getting through. 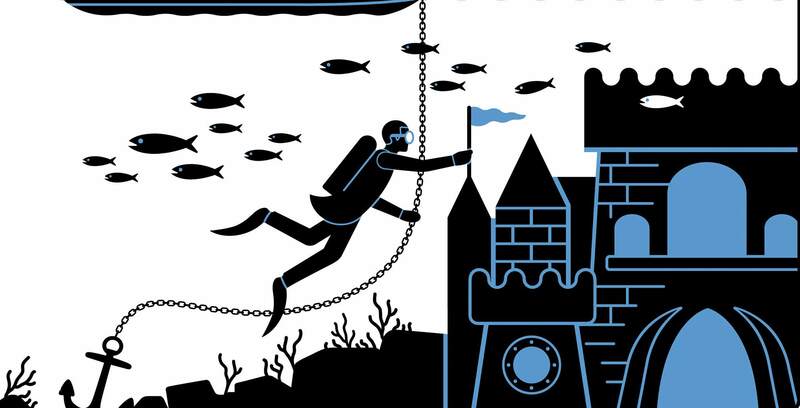 Many executives cannot seem to resist the siren call of quarterly results that please investors, spending extra cash on stock buybacks to reach immediate goals. Japan’s Tokyo Stock Exchange set a record earlier this year, with more than 280 companies announcing buyback plans totaling Y3.9 trillion, according to The Financial Times. The S&P 500 and Europe’s STOXX 600 are seeing similarly high rates of buybacks. Yet the reality is that investments in innovative growth, not stock buybacks, are what create new value for the customer, help shield companies from disruption and fuel the future. 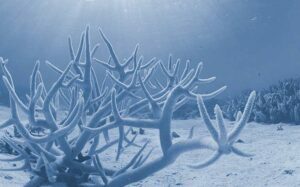 The challenge is identifying those rich unexplored areas of potential evolution that lie between today’s business and tomorrow’s possibilities. These areas are a company’s strategic frontiers: the markets, products, technologies or processes that are found just beyond the current corporate strategy or business model. To push past average performance and growth, companies must be brave enough to venture into these new horizons. Exploring and executing on strategic frontiers will align senior leadership, key stakeholders and potentially the entire organization on the path toward the future by defining what is next. How big that future will be, however, depends on where you concentrate your efforts. 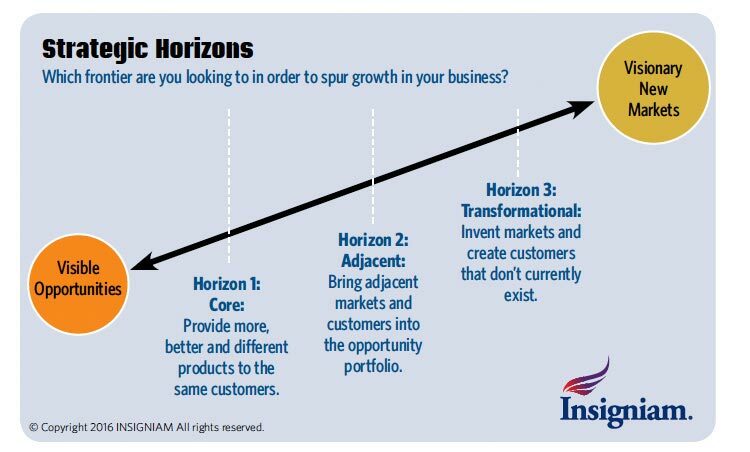 Transformational (Horizon 3): Focuses on seeding options today for future profitable growth in markets and customers completely new to the enterprise or even to the industry. Transformational frontiers represent breakthroughs that can be industry changing and require a substantial investment of time and resources. The core and adjacent horizons are quicker wins because they are closer to existing operations. But they will not produce dramatic results or revenue increases. That requires thinking—and then acting—radically. By starting with the transformational horizon, you will gain access to all three horizons at once. Consider Apple: It was strictly a computer company until it made its foray into the music business with the launch of the iPod and iTunes, which led to vast new revenue streams and reinvigorated the core business. Or take Netflix’s pivot to produce original, award-winning programming (later copied by Hulu and Amazon), which brought in more viewers—and subscribers. Each of these transformational opportunities cascaded backward to fuel existing products and markets. Research shows ROI is higher in horizon three. 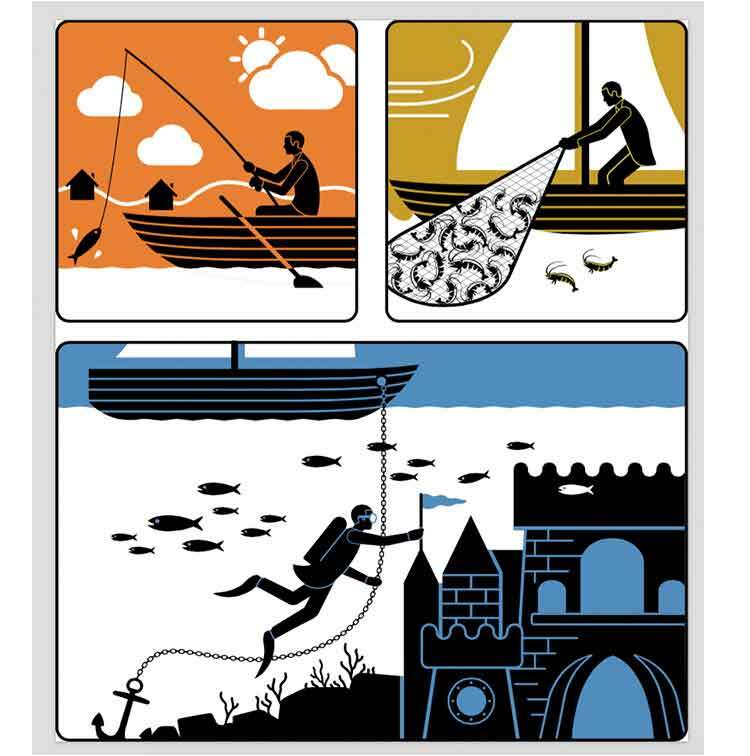 Managing Your Innovation Portfolio from the Harvard Business Review contends that investments in strategic horizons should be allocated with 70 percent in the core horizon, 20 percent in the adjacent and 10 percent in the transformational. The ROI on these investments will be inverse: 10 percent from the core horizon, 20 percent from adjacent and 70 percent from the transformational. We believe the transformational investment should be even larger. Insigniam has seen firsthand what is possible when companies commit to achieving breakthroughs by investing beyond the recommended 10 percent. The core and adjacent horizons are quicker wins because they are closer to existing operations. But they will not produce dramatic results or revenue increases. Case in point: Executives at a U.S.-based multinational conglomerate with a century’s worth of history were concerned that their growth horizons were too heavily focused on horizon one. The CEO decided to redistribute 20 percent from the global R&D budget to the horizon two and three pipelines for new growth opportunities. In doing so, the company created a set of criteria, mandating that potential strategic frontiers must have $100 million ROI potential, be based on global market reach, use the company’s proprietary technology and change the basis of competition. Four years after the shift in investment priorities, the CEO valued growth opportunities borne from this process at $6 billion. His successor likewise saw the value and immediately upped the ante, dedicating 25 percent of R&D dollars to the transformational horizon. This example is not unique. Stories can be found throughout history of organizations investing in transformational strategic frontiers and finding incredible ROI and breakthrough performance. There is an added benefit of focusing first on the transformational and working back: It challenges the team tasked with exploring strategic frontiers to leap beyond false assumptions that act as constraints on how the company might create and deliver new value in the future. Because while you may have ideas about where opportunities lie, the goal of horizon three is to push beyond the conventional—and that requires exploring opinions from a variety of sources. 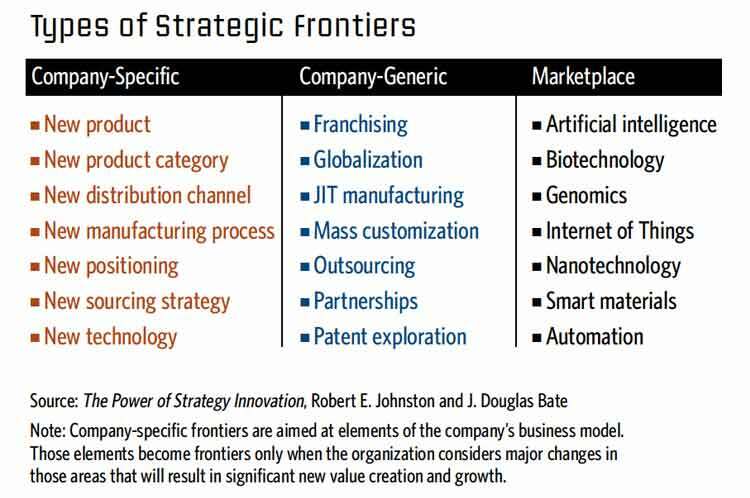 In The Power of Strategy Innovation, J. Douglas Bate and Robert E. Johnston (also a co-author of this article) describe the first phase of a strategic frontiers effort as developing a Discovery team. Typically with eight to 12 members, this team conducts reconnaissance, exploring the future and reporting back the business opportunities they find there. The best candidates for this team are people capable of making observations in new environments and contexts as well as people excited by this type of work. With this team in place, you must identify closely held working assumptions about the future—and then break them down. As management consultant Gary Hamel once said, to their detriment companies often use a rearview mirror to inform the future. One-third of assumptions are accurate. Through a process of examination, they are understood in new ways. This is a powerful aligning experience. One-third of assumptions are somewhat off. Often, they must be modified or reframed in a certain way—but again, that process has a powerful aligning effect. One-third of assumptions are flat-out wrong. This is the most important outcome when identifying assumptions about the future, as it enables you to replace false assumptions with new ones. The most powerful tool for breaking down assumptions is to convene a thought leader panel, in which world-leading thinkers challenge the status quo and long-held beliefs within your organization. Whether focused on demographic trends, technology or regulations, panelists should play the role of provocateur, not consultant. They should offer their views of the future based on their area of expertise. But they are not offering answers; instead, the executives should be the ones stimulating fresh thinking and fostering changes in alignment based on newly acquired knowledge. Opening yourself up to new frontiers means living up to the future. Click To Tweet It requires a shift away from strictly “sustaining the fortress” management (aka managing for today). That tends to be a numbers-driven, company-centric and linear practice that extends current values from today into the future. And while it might seem pragmatic, in today’s highly dynamic market landscape, this approach is more like leaving the door open for an invasion. If Apple had not launched the iPod and later its revolutionary iPhone business, it would have seen the continual erosion of its original core computer market with less and less software being written for its products. The only way to survive the future is to create it. And that requires changing the way you think. Once you commit to the exploration of strategic frontiers, meeting quarterly revenue targets becomes a byproduct of success, not a driver of it. Every organization’s innovation infrastructure must include a way to measure the value generated. Although there is no standardized template, metrics are the only way to track the ROI of all your efforts pursuing new frontiers. Otherwise, returns from innovation run the risk of getting lost in everyday gap accounting and lumped into regular income.